The beautiful Miss Earth Netherlands 2004, Saadia Himi is one of our all time favorite queens. Robin of Miss Holland Now, personally nominated Saadia. In 2009 she also represented the Netherlands at the Miss Civilization of the World and in 2011 she participated in Miss All Nations, where she made the semi-finals. In 2007 we produced our 12 Months of Beauty Calendar. When we asked Saadia if she wanted to participate in this project, she said yes immediately. Her picture was not only used inside the calendar but also as the cover. 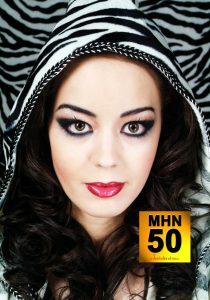 Saadia is the 4th nominee and therefore she is one of the Top 150 queens for the MHN50.